Some like it hot. Some like it cold. With every room zoned independently, everyone can have their room at the temperature which they feel comfortable. In standard systems, a selection constant must remain open at all times to prevent air pressure building up and damaging the ductwork. This zone can occupy up to 25% of a home and you will pay to heat or cool it, regardless of whether you are using that room. Zone 6 dumps the permanent selection constant. A preselected electronic selection constant only opens when needed, saving you from wasting conditioned air and energy. 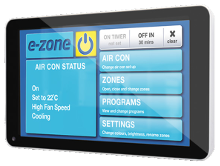 An optional extra to your Advantage Air Zone Control system, your Apple devices can control your air-conditioning system through your home wifi. 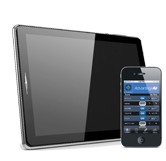 With this functionality your iPhone, iPod or iPad can be used as an additional remote control for your system. It means whenever you want to adjust airflow or turn off a zone, chances are you have a remote control within reach. Housed in the ducting, dampers control how much air goes where. Being complete control freaks, we were never going to be satisfied with imprecise conventional dampers, so we designed our own; the Exact Air Regulator. 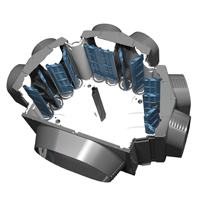 Instead of the usual single "scoop" damper, it has four Opposed Blades, hence the term Opposed Blade Dampers. Think of them of as a series of double doors that can open and close in precise increments, versus a standard damper that hinges like a pivot door. You’re rewarded with smoother, quieter more even airflow, while we were rewarded with an Australian Design Mark award for innovation. If you’re smart enough to purchase an Advantage Air system, you deserve to breathe rarified, purified air. Our triple layer filters are electrostatic to attract more particles to the fibres and keep them there, resulting in 30% cleaner air than standard filters. 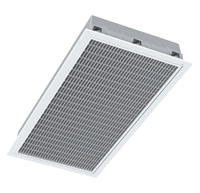 It’s housed within a clever Purtech Return Air Grille that has an optional LED warning light that lets you know when the filter needs cleaning. As a dirty grill and filter can directly impact on a system’s efficiency, ours have both been designed for easy cleaning. They’re both covered by a 10 year warranty, anything less is a choke. All ducting is not created equal. 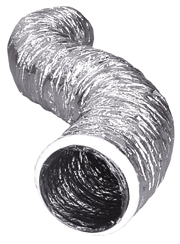 We’ve further improved our ducting’s insulation properties by lining it in high density polyester. Plus we’ve included a stainless steel spring inner coil for added strength and shape retention. The result of all this engineering is our ducting meets Australian strength, mould, temperature and fire standards. And if that doesn’t blow you away, the 10-year warranty will. Our StreemLine air conditioning diffuser has an adjustable 7-point setting system that lets you diffuse cool air across the ceiling, or hot air down into the room. Unlike our competitors' diffusers, the blades sit flush with the ceiling and don't protrude into the room. This stylish diffuser has been designed to compliment modern homes. It can be used in conjunction with other diffusers. Its compact size makes it perfect for wall applications. Ensures whisper quiet cooling with air gently diffused to all corners of the room. A premium diffuser which adds a touch of style and class to any home. It's unobtrusive design ensures it compliments, rather than dominates, any room. Being round, it diffuses air equally to all parts of the room. It compliments round light fittings and downlights, ensuring minimal visual impact.